Junior Surf is based around the premise of encouraging all children to have fun, participate safely and develop skills and confidence in the surf. Children are taught water confidence, general surf awareness and competition skills through instruction and fun on the beach. Safety for the participants is a top priority, alongside having fun! Qualified Surf Lifeguards are always present to ensure safety. Parents/caregivers are encouraged to help out with the program. Training can be provided for those interested. 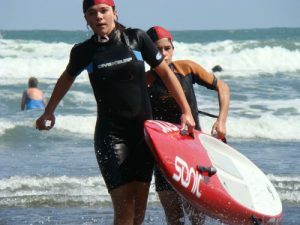 Trust Waikato Raglan Surf Life Saving Club holds junior surf sessions regularly during summer. Several regional and national carnivals are available for those keen on competition. If you or your children are interested in the Juniors/Rookies programs, please contact our Convenor Anne Snowden – 021 223 7545 for more information.